Microwave Wave Guides perfectly used in various machines for their vigorous construction, most advantageous functionality, precise dimensions and longer service life. 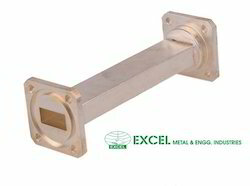 We fabricate these microwave guides straight section using quality materials based on well-advanced mechanisms and highly sophisticated technology in complying with the quality standards and norms. 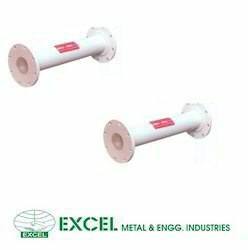 These products are available in various sizes, shapes and dimensions as per the requirements of clients. 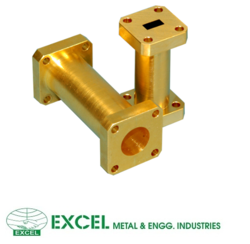 We take pleasure to introduce ourselves to you as one of the leading Importers, Manufacturers, Stokists & Suppliers of BRASS,COPPER & ALUMINIUM-ALLOYS microwave guides straight section in the form of Rectangular and round as per details given below and also industrial Raw materials, Ferrous & Non- Ferrous Metals wich we supply from our bulk stock of materials RECTANGULAR WAVE GUIDES - In size WR 10, WR 15, WR 28, WR 42, WR 62, WR 75, WR 90, WR 90, WR 112, WR 137, WR 159, WR 187, WR 229, WR 284, WR 340, WR 430 AND WR 650 ROUND WAVE GUIDES - In size WC 28, WC 44, WC 59, WC 128,Wc 205 AND Wc 281Other big sizes as per requirements You may be in regular requirement of above item and we are at your service to supply the best quality material at a reasonable rate. Since we have vast know-how in this field and we supply industrial raw materials, ferrous & non-ferrous metal to several Govt.& semi-Govt. cos. Like SAMEER/DRDO/BEL/SICO/MTRD/ISRO/DAE/MANY RESEAECH LAB.etc. You may be in regular requirement of above item and we are at your service to supply the best quality material at a reasonable rate. Since we have vast know-how in this field and we supply industrial raw materials, ferrous & non-ferrous metal to several Govt.& semi-Govt. cos. Like SAMEER/DRDO/BEL/SICO/MTRD/ISRO/DAE/MANY RESEAECH LAB.etc. We are manufacturer of Copper Wave guide.